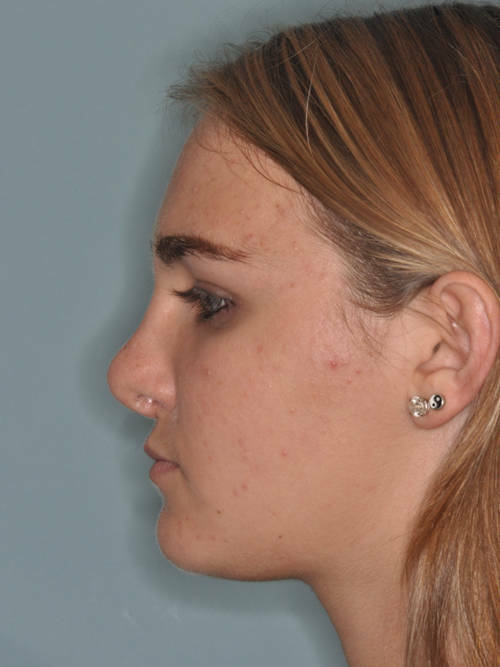 Female patient who had undergone a previous rhinoplasty elsewhere and was left with the resultant deformities. 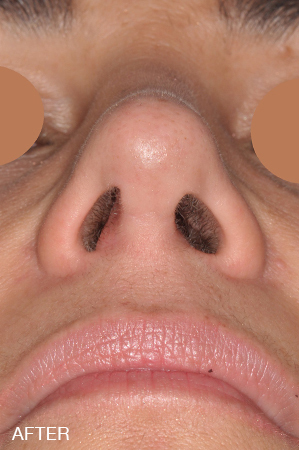 Reductive rhinoplasty techniques resulted in an inverted-V middle vault deformity, pointy nasal tip, low bridge and an over-projected nasal tip. 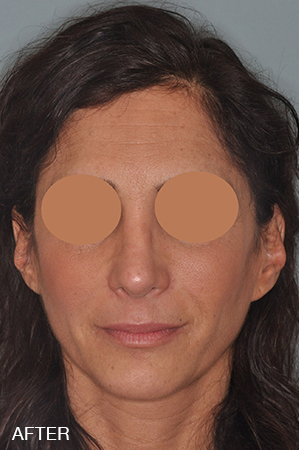 Revision rhinoplasty techniques to address her concerns included bilateral spreader grafts, dorsal onlay graft with temporalis fascia, tip de-projection onto a caudal extension graft, and lateral crural repositioning. 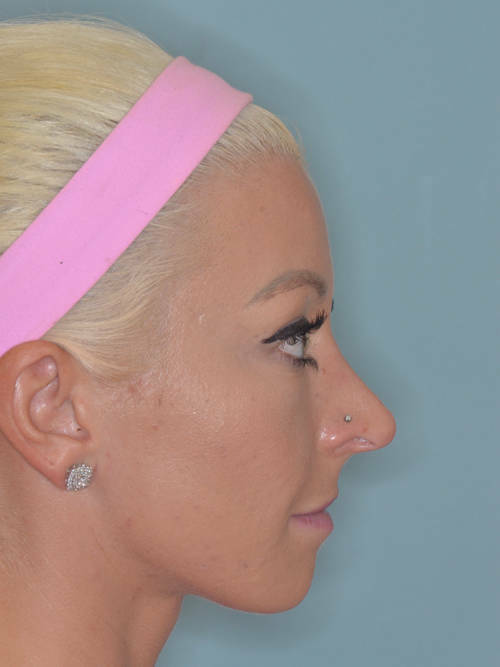 Post-operatively, she demonstrates improved bridge height, softening of the nasal tip, correction of the middle vault, and de-projection of the tip to help balance her profile. 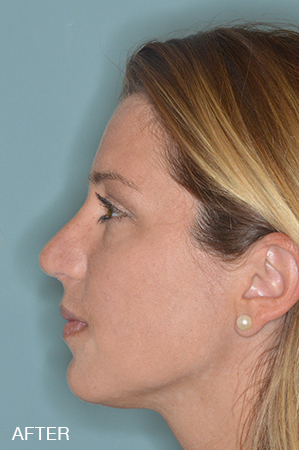 Complicated revision rhinoplasty of a patient who had sustained trauma to the nose as previous corrective surgery. 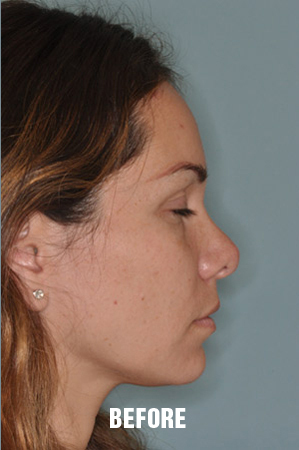 Rib cartilage was used for the reconstruction of the nose given that the patient did not have septal cartilage. 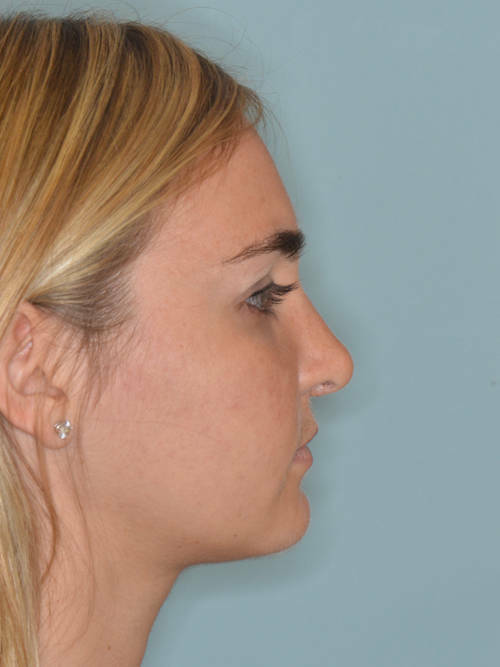 Her other concerns included the raising of the tip on the profile and the lowering of the hump. 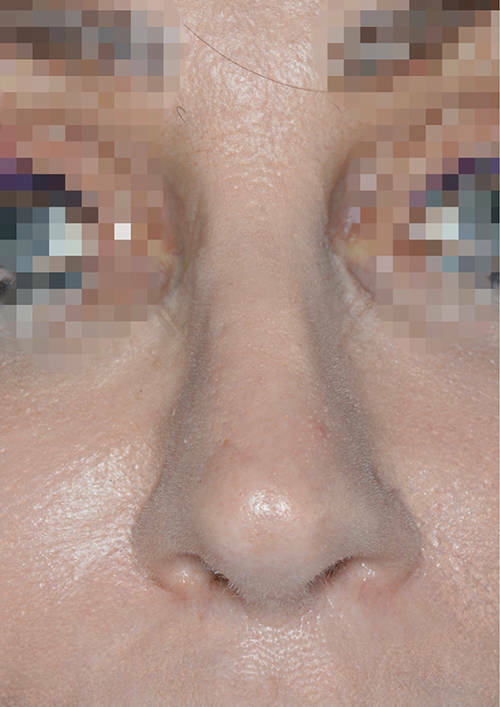 Revision rhinoplasty techniques included bilateral osteotomies, extracorporeal septoplasty, caudal septal replacement graft and tip onlay graft. 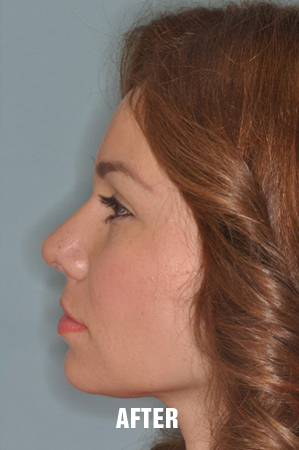 This patient who had undergone a previous rhinoplasty was seeking to refine the tip and narrow the nose. She was not concerned about her profile view. 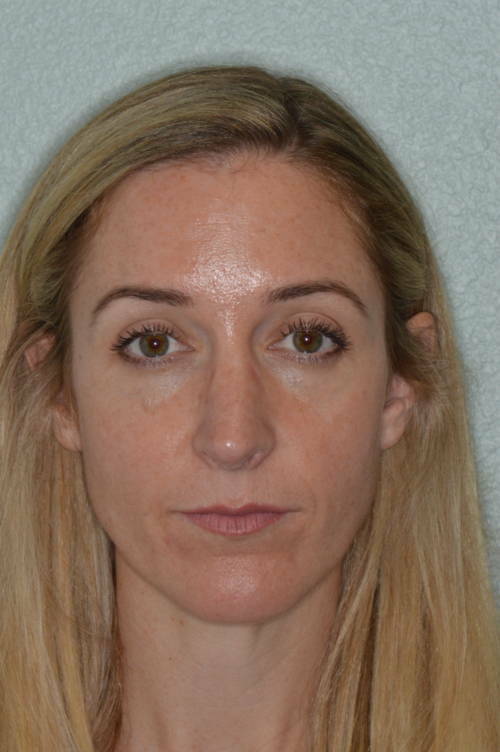 She was noted to have thicker nasal skin. 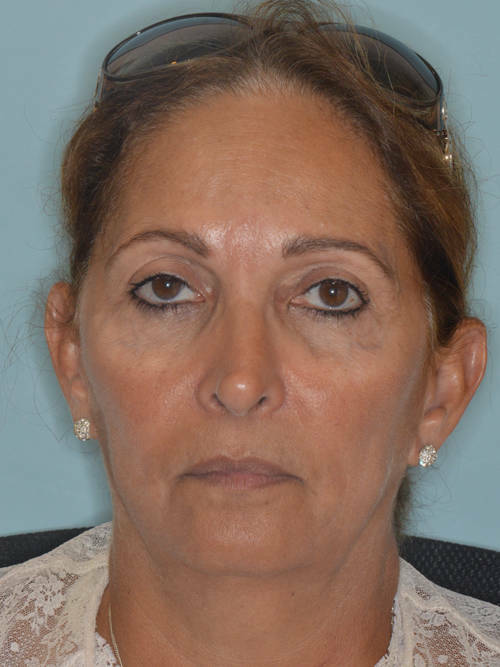 She was found intra-operatively to have had previous de-fatting of the skin and tip cartilage reduction. 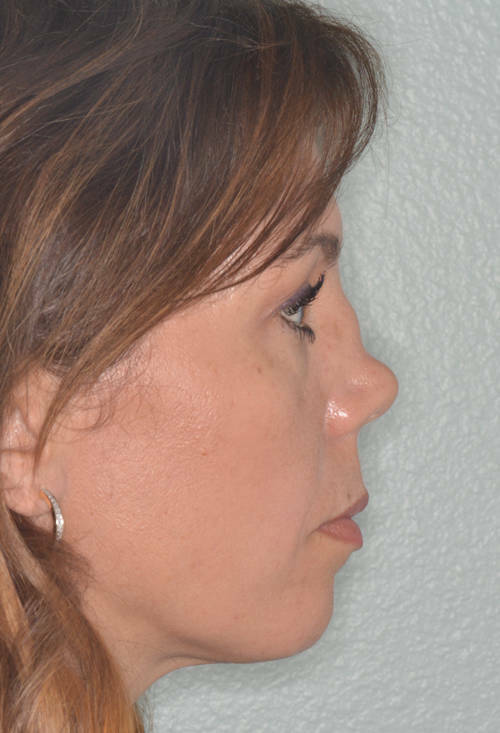 Given her thick skin, she needed strong tip cartilage support to create refinements. 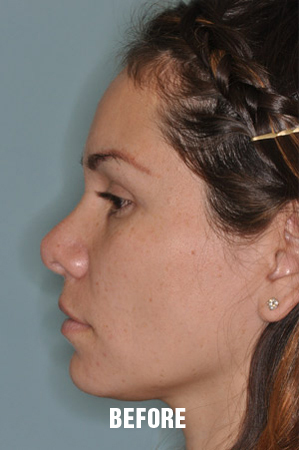 Revision rhinoplasty techniques included caudal septal extension graft and tip only graft using cartilage from the septum. 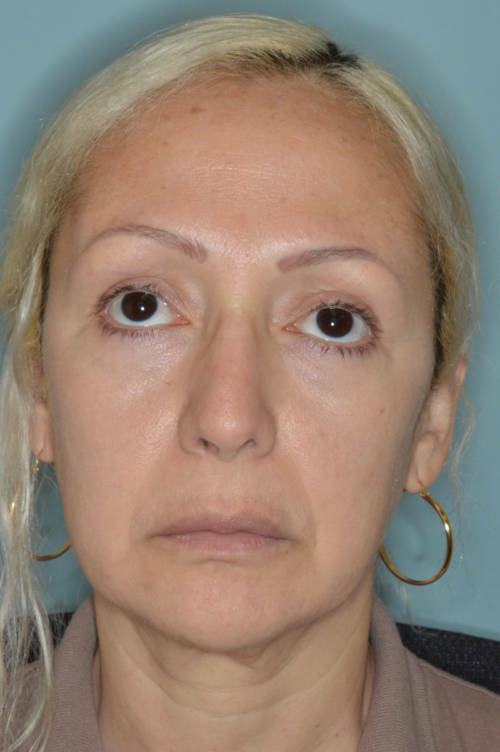 Patient had undergone a previous rhinoplasty and presented with complaints of nasal tip deformities and inability to breathe through the nose. 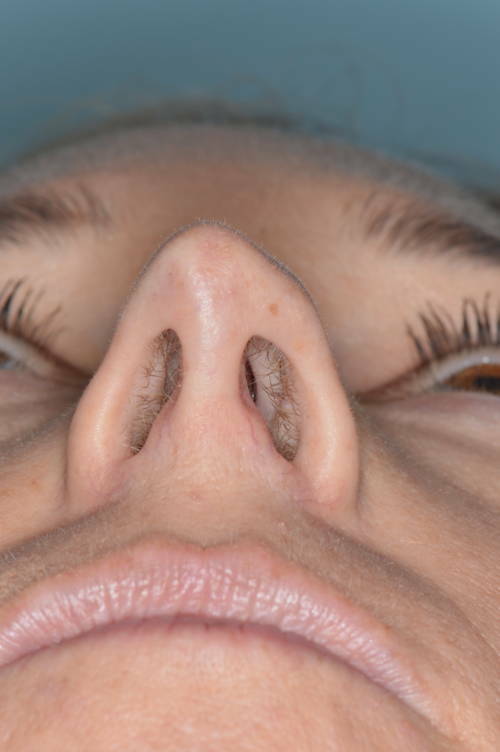 She was noted to have significant nasal valve collapse and nasal deformities. 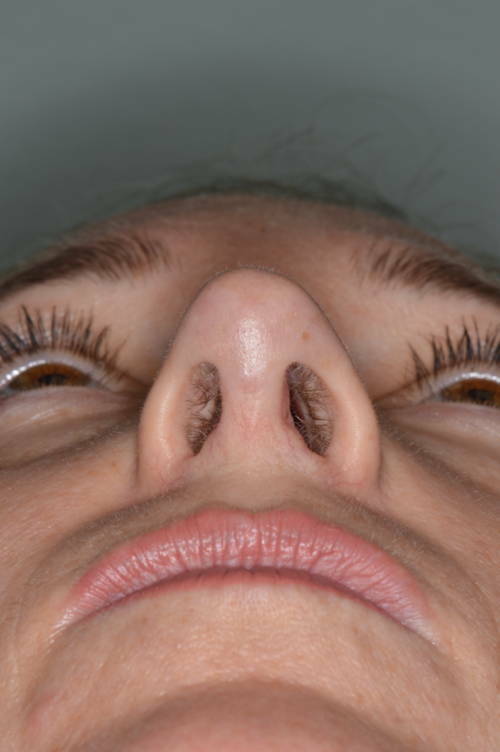 Base view before the revision rhinoplasty shows significant nostril asymmetry and nasal valve collapse. 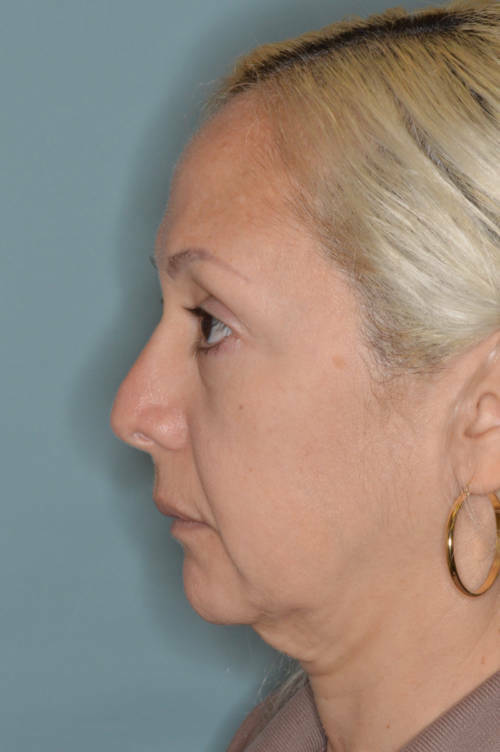 She was noted to have cephalically oriented lateral crural cartilages with over-resection of the lateral cartilages creating tip irregularities and nostril asymmetry. 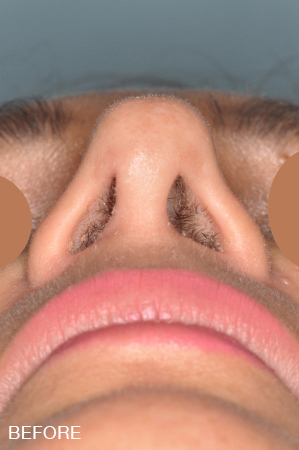 Revision rhinoplasty techniques included the use of septal cartilage for the placement of bilateral spreader grafts for middle vault support. 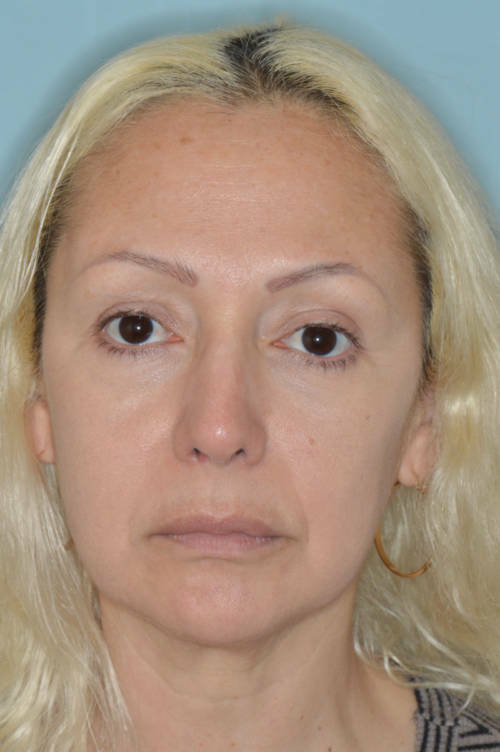 The tip deformities and breathing problems were corrected with the caudal septal extension graft, lateral crural strut grafts with lateral crural re-positioning, and tip onlay grafts. 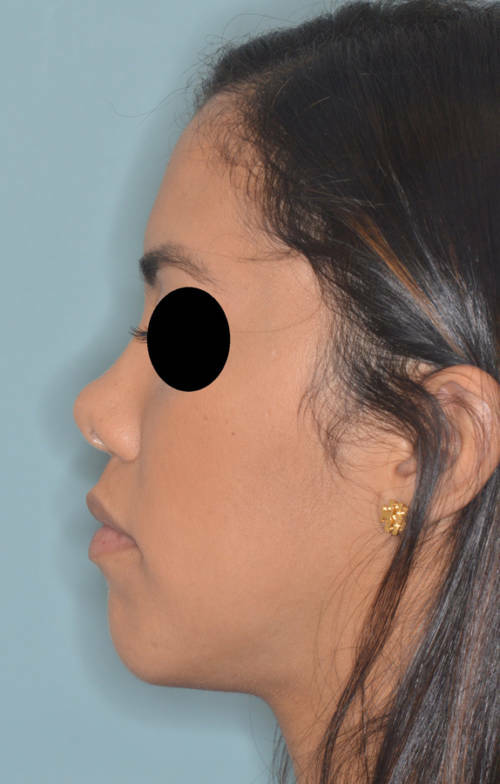 Post-operatively, the tip deformities were corrected, nasal valve obstruction corrected, and nostril asymmetry corrected while the profile aesthetics were preserved. 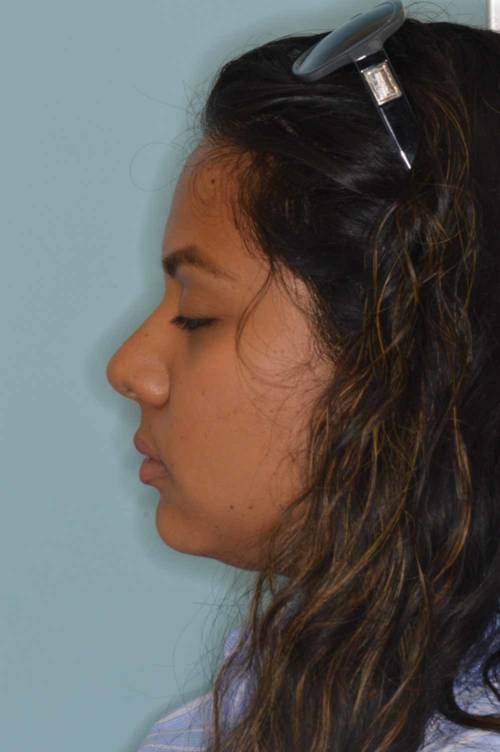 Patient with a saddle nose deformity. 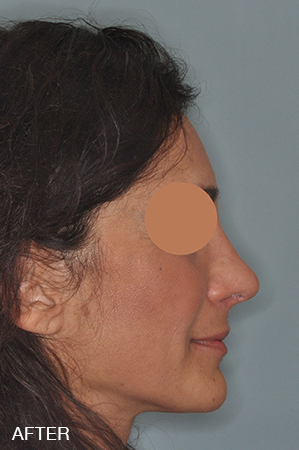 Rhinoplasty techniques included the use of rub cartilage graft to correct. 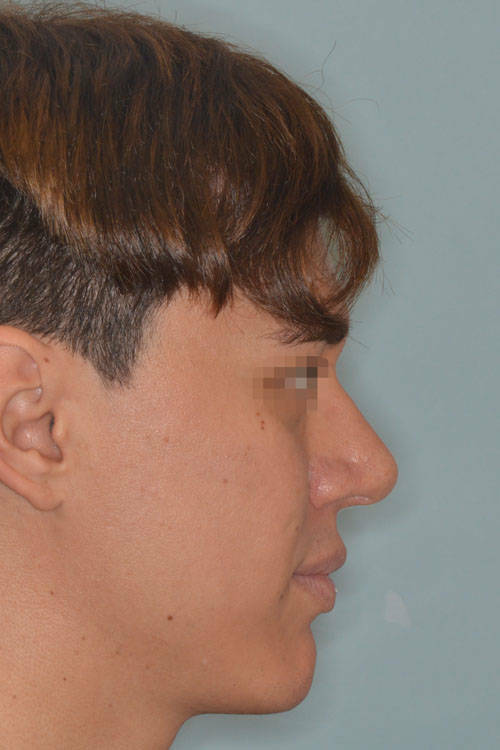 Techniques for counter-rotation and dorsal augmentation included dorsal grafting, bilateral spreader grafts, and caudal septal extension graft. 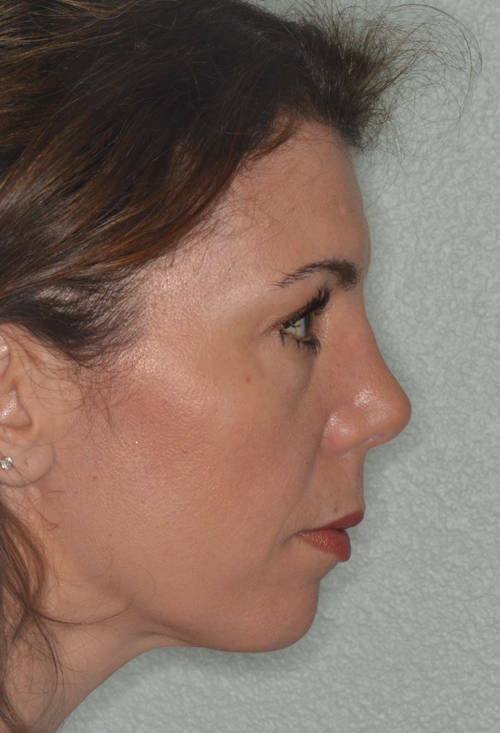 Before and after revision rhinoplasty for a 60 year old patient. 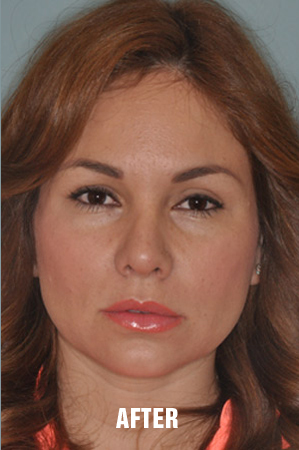 Patient underwent a primary rhinoplasty 20 years prior. 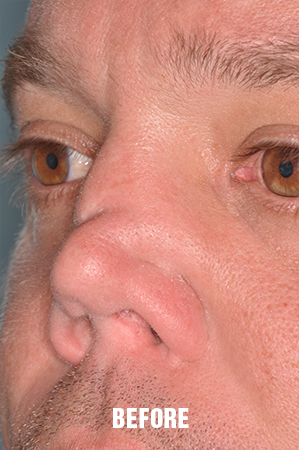 Subsequently, developed a crooked nose deformity with nasal obstruction. 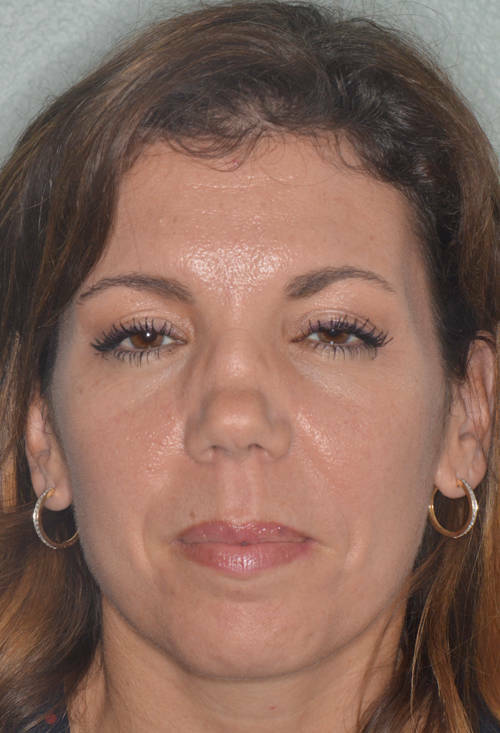 She could not breath out of both nostrils but the right side was the worse side. 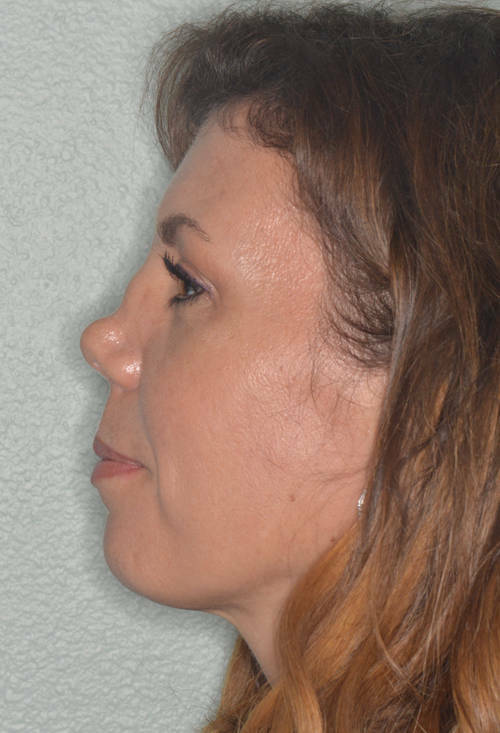 She underwent a revision rhinoplasty which techniques included the use of ear cartilage, unilateral osteotomy to out-fracture the right nasal bone, double spreader grafts on the right side and a batten graft on the right side to improve the crooked appearance to the upper and middle third of the nose. Techniques to the tip included caudal septal extension graft with bilateral, lateral crural strut grafts for lower lateral cartilage repositioning. 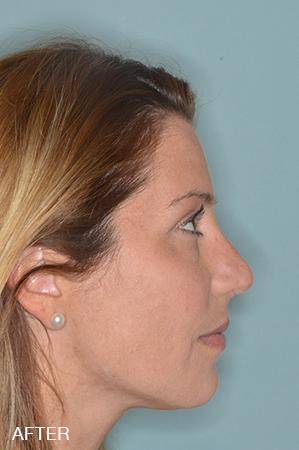 Profile views were essentially unchanged with improvement in the crookedness of the nose and nostril asymmetry. 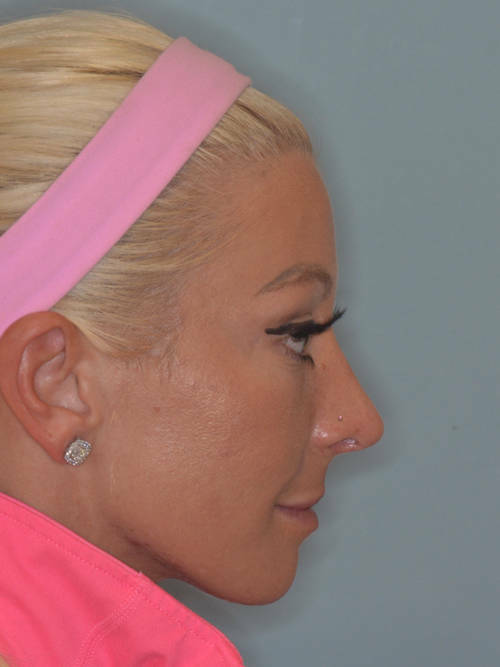 Revision rhinoplasty for an over-projected nose, pinched middle vault, and pointy tip. 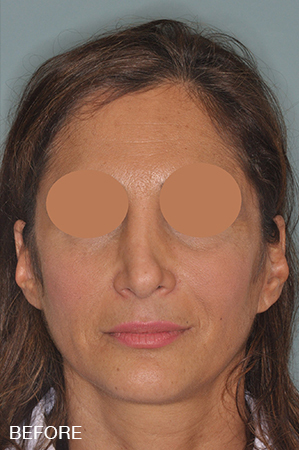 Techniques for the middle third and bridge included the use of temporalis fascia for bridge and radix elevation and bilateral spreader grafts. 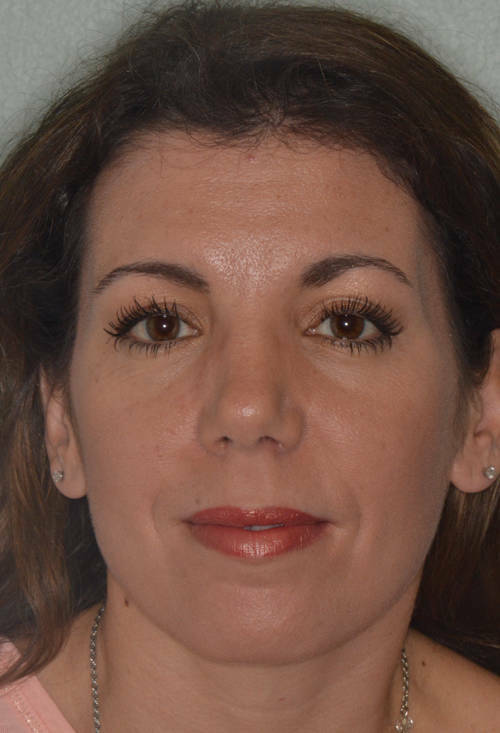 The tip was de-projected and supported onto a caudal septal extension graft. 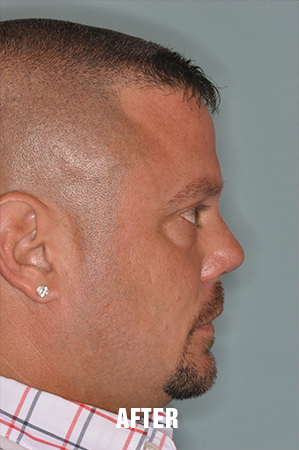 Tip softening was achieved with lateral crural strut grafts and a tip onlay graft. 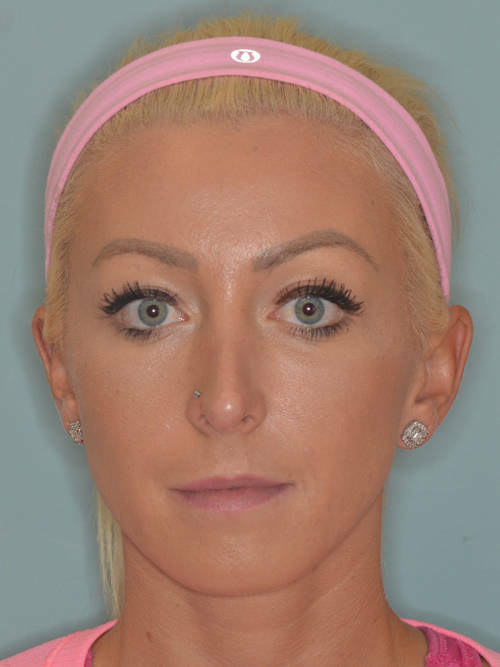 Patient with the concern of a “scooped” bridge after initial rhinoplasty. 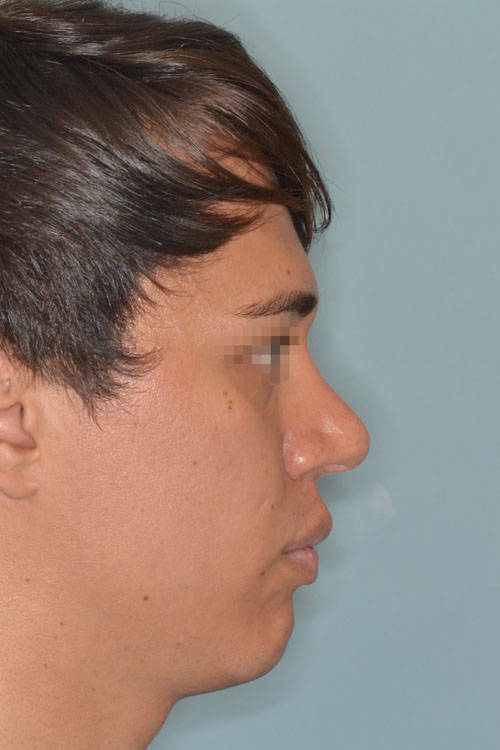 He was evaluated for revision rhinoplasty to raise bridge to give a straighter appearance to the profile. 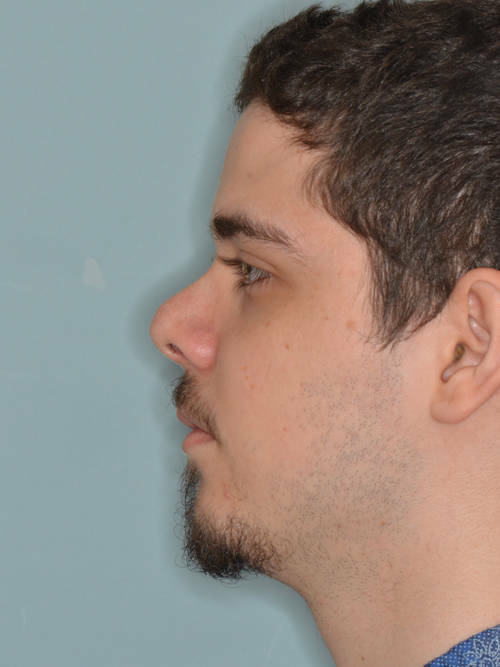 A chin implant was also recommended to balance his profile. 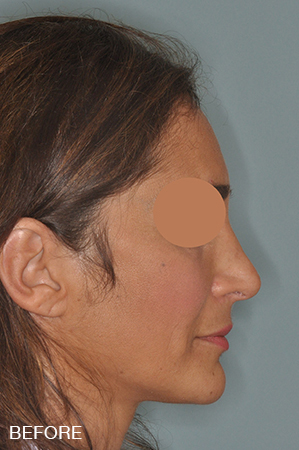 Revision rhinoplasty techniques included the use of temporalis fascia and ear cartilage graft to raise the bridge. 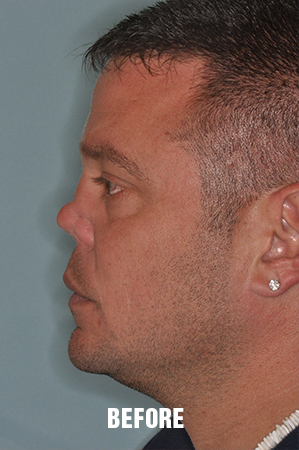 A medium silastic chin implant was placed to help balance the profile. 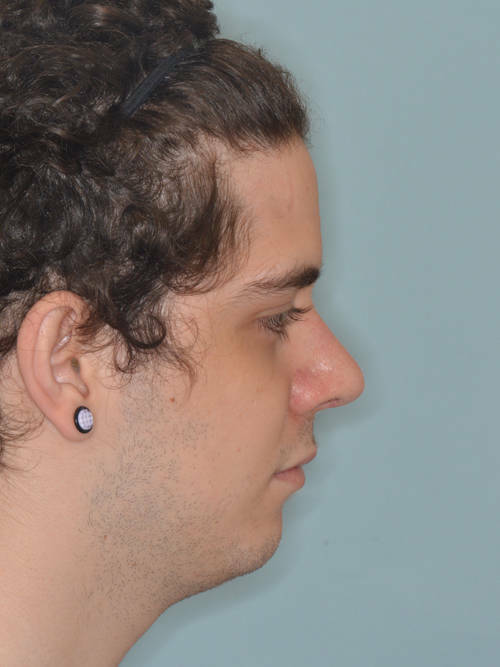 Revision rhinoplasty performed on a patient with a previous rhinoplasty which left him with a severely upturned tip. 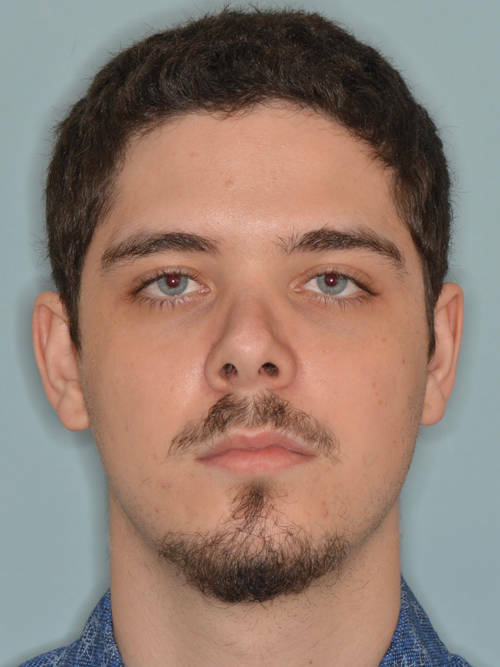 On the frontal view, he felt that his nose was too upturned, revealing too much of his nostrils. 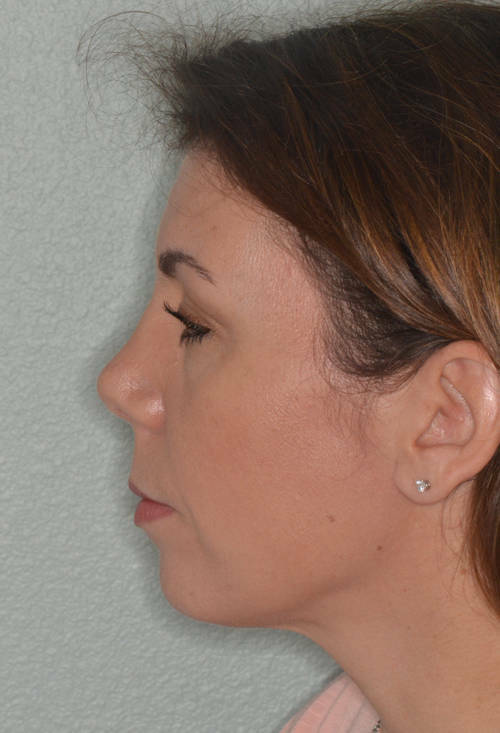 The profile revealed a low bridge and upturned tip. 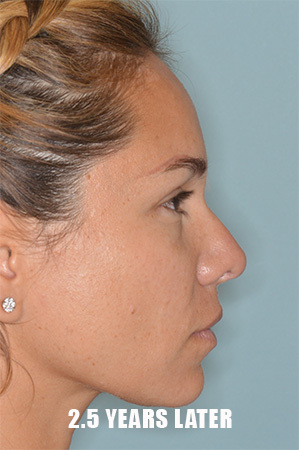 Revision rhinoplasty techniques included the use of ear cartilage and temporalis fascia to raise the bridge of the nose. 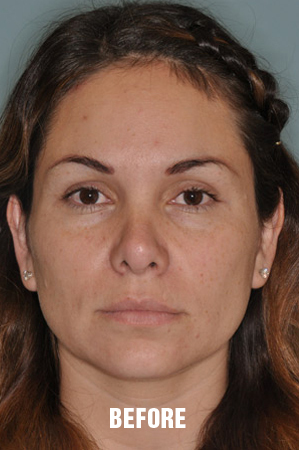 Lower lateral crural strut grafts and caudal a caudal septal extension graft was used to counter-rotate the tip. 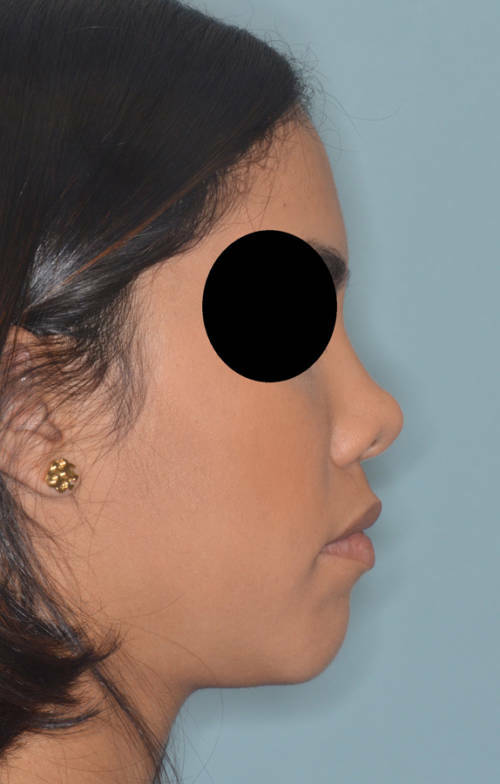 Challenging revision rhinoplasty case of a young female patient with thick nasal skin who had undergone 3 prior nasal surgeries. 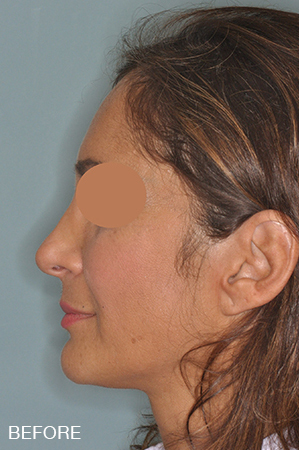 She was noted to have an upturned and overly rotated tip, wide and bulbous tip appearance, and deviated nose. 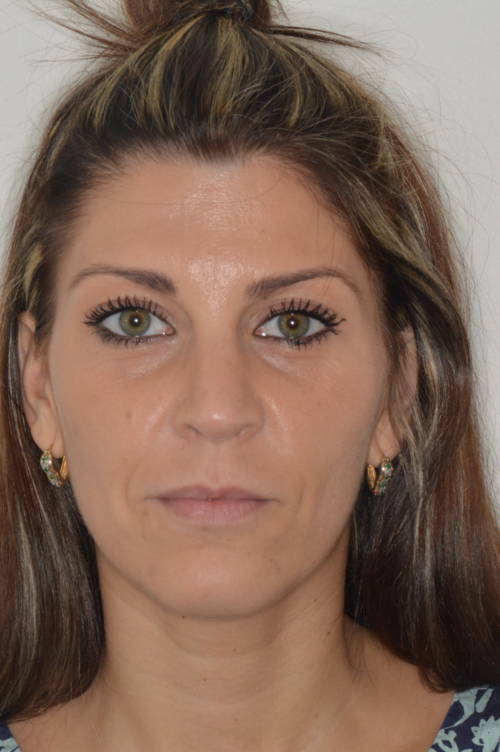 Intra-operative findings included the prior placement of cadaveric rib cartilage as a dorsal implant and artificial dermal substitute previously placed on the tip. 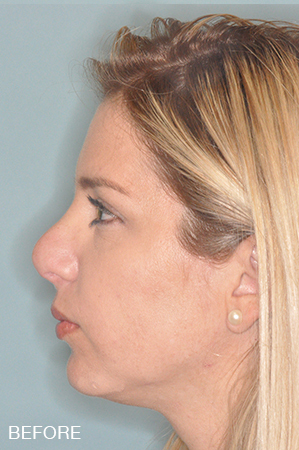 Revision rhinoplasty techniques included the use of rib cartilage, replacement and fixation of dorsal implant, lateral crural strut grafts and composite ear graft. 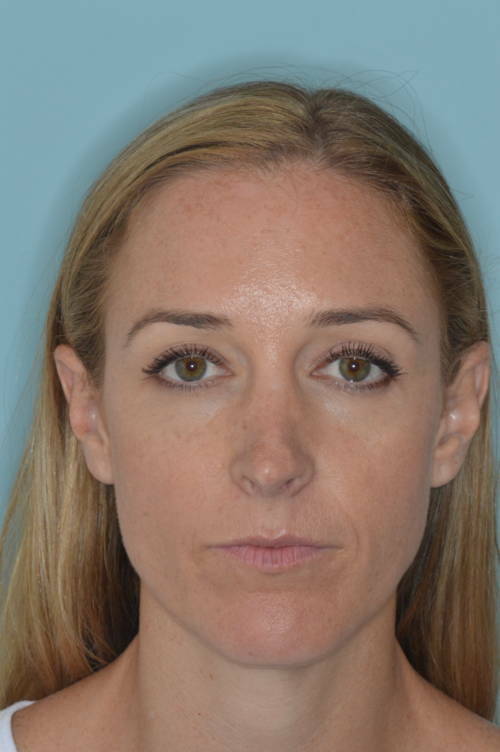 Very challenging revision case given the thick nasal skin and the previous use of dermal substitute on the tip as well as the multiple prior procedures. 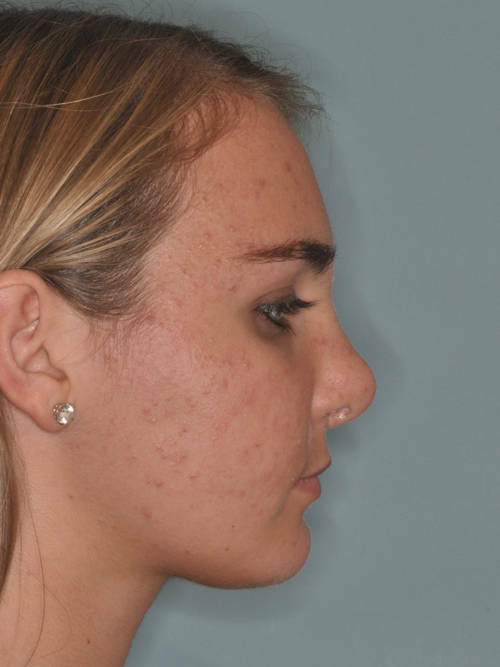 Tip refinement is limited by the thicker skin coverage and scarring from the dermal substitute and prior procedures. 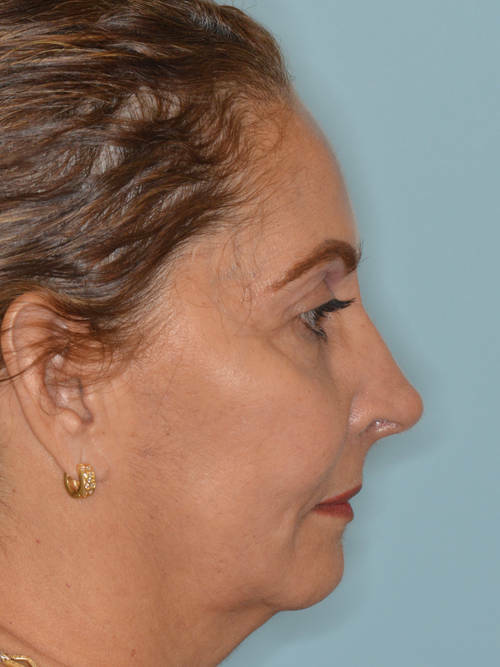 The nose now appears with a greater degree of tip refinement and tip counter-rotation as well as a straightening of the dorsum. 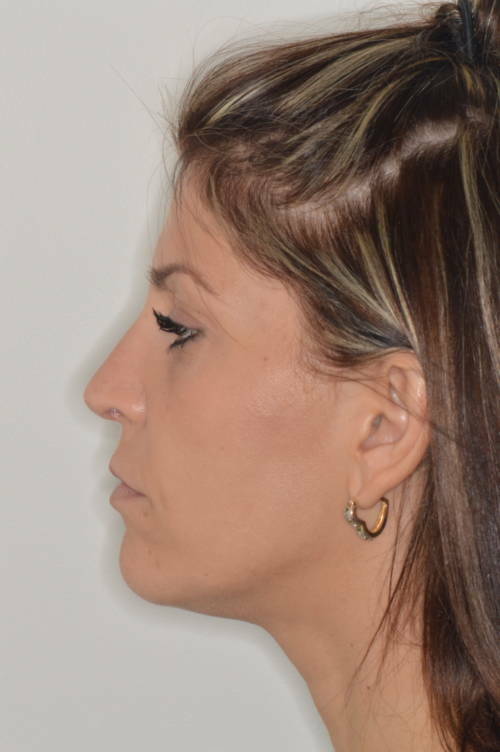 Female patient who had undergone a previous rhinoplasty and presented with the complaints of tip deformity. 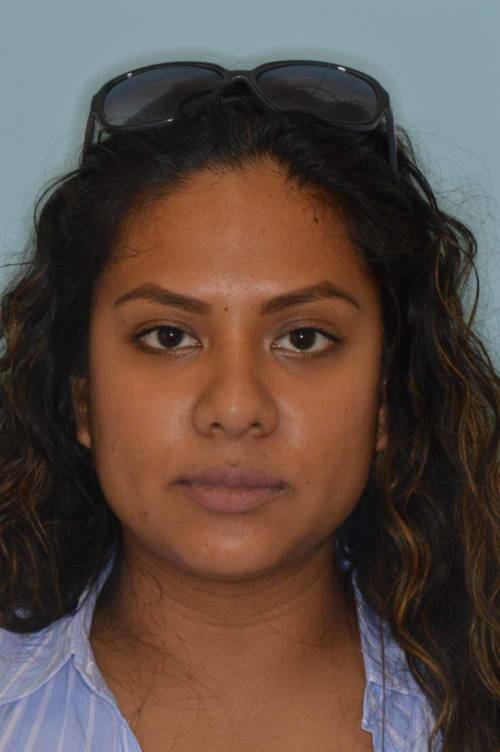 She was found to have developed a lack of tip support which resulted in what is known as a “pollybeak deformity.” She was noted to have thick nasal skin. 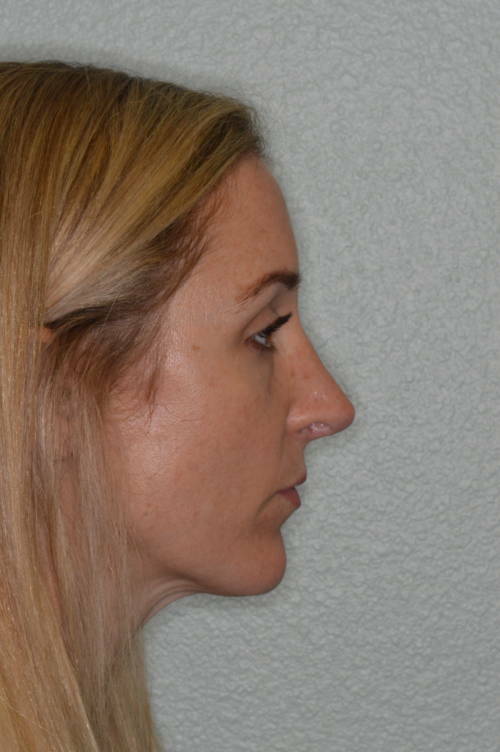 Revision rhinoplasty included a caudal septal extension graft for tip support and tip only grafts for further tip definition. 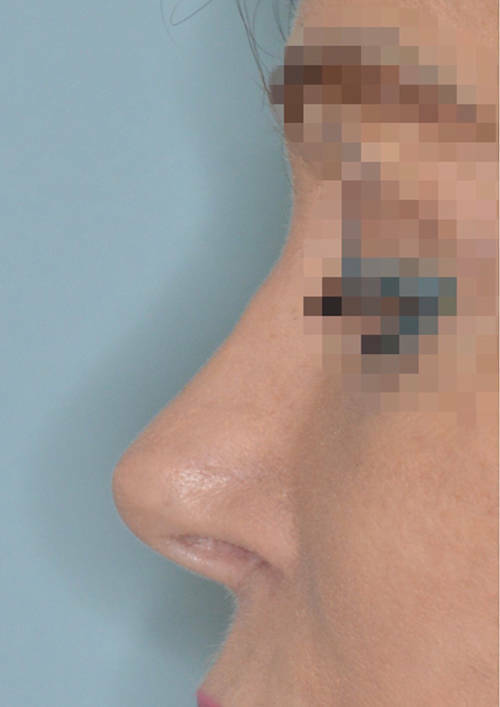 Post-operatively we see the subtle supra tip break which helps to distinguish the tip from the nasal bridge and give the tip more definition. 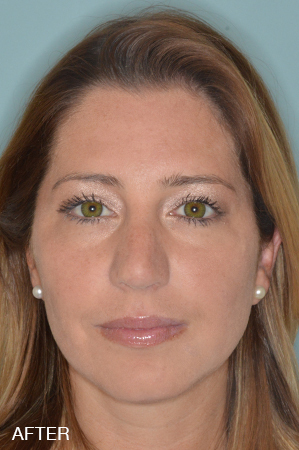 Female patient who had undergone a previous rhinoplasty 5 years prior. 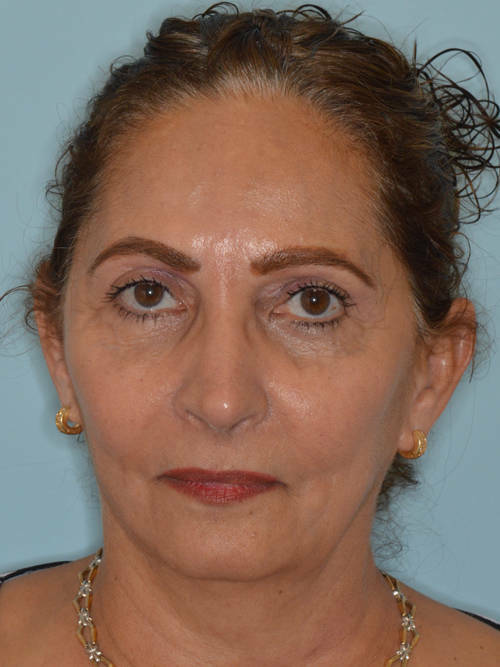 Complained of an upturned tip and excessive nostril show. 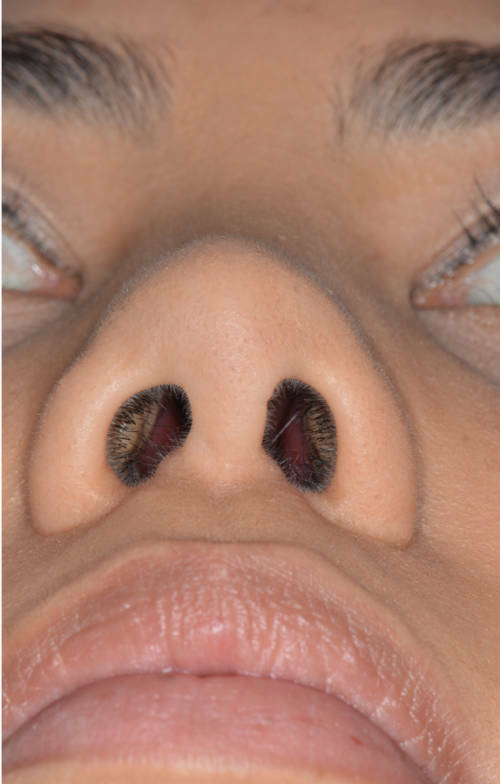 Intra-operatively, she was found to have a columellar start placed between her tip cartilages which had not provided adequate tip support. 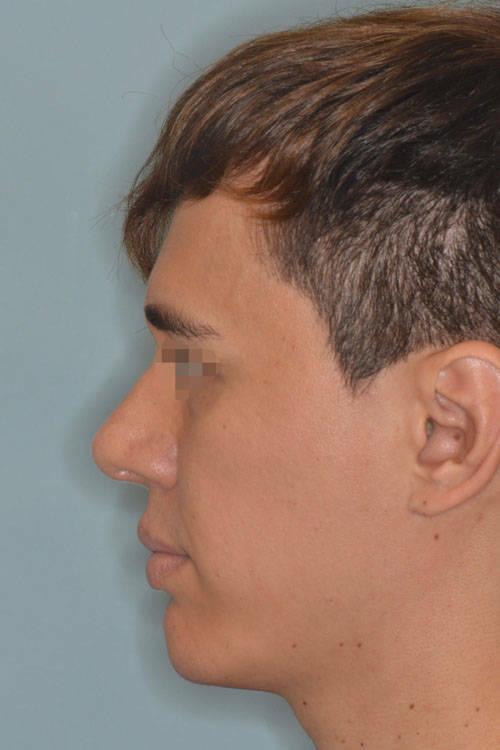 Ear cartilage was used to place a caudal septal extension graft as a previous septoplasty had been performed and insufficient cartilage was present. 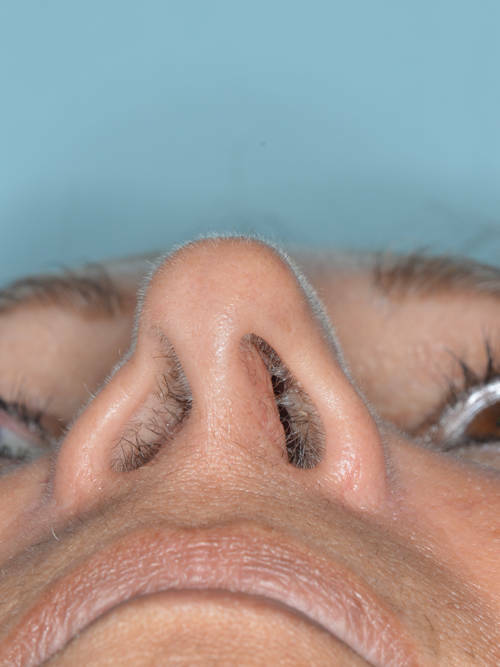 A caudal septal extension graft was used to counter-rotate the tip and to help decrease nostril show from the frontal view. 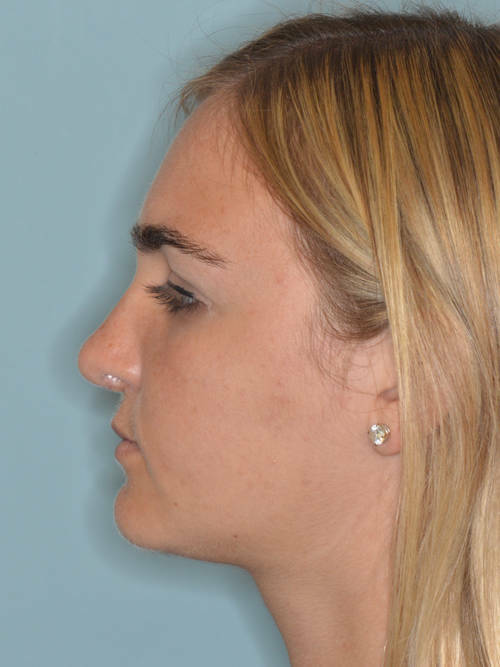 Revision rhinoplasty of a female patient with a significantly foreshortened nose. 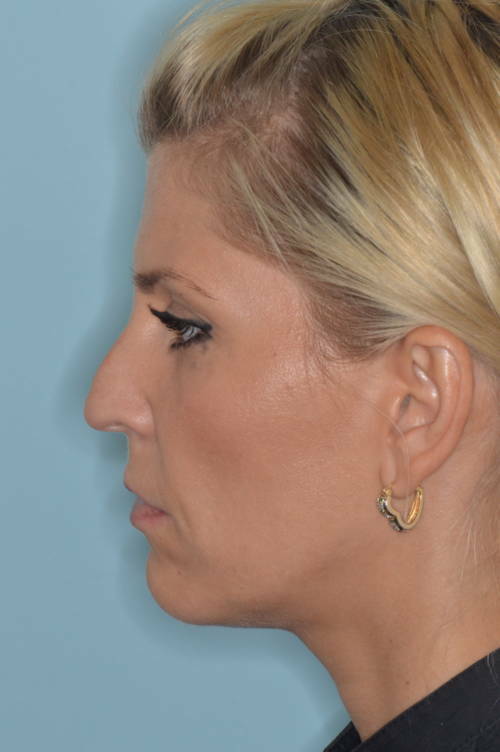 Patient had undergone a previous rhinoplasty 10 years prior. 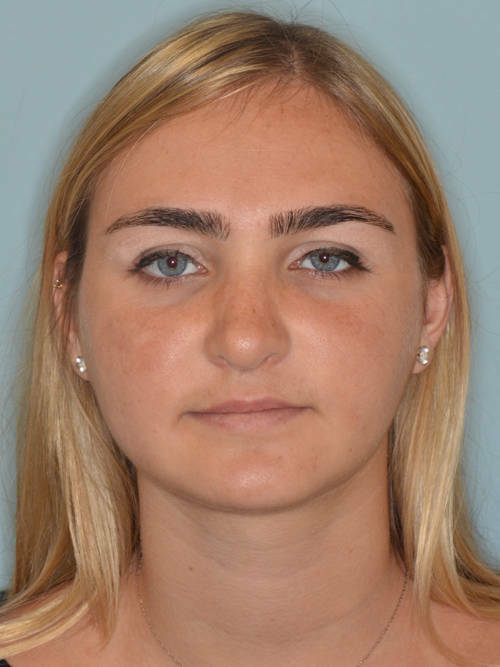 Her main concerns were the unnatural appearance of her tip, being upturned and foreshortened. 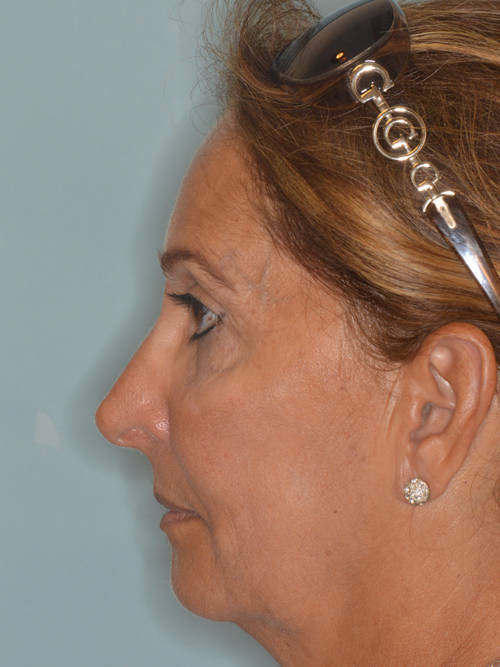 Her frontal view showed an amorphous and upturned nasal tip with excessive nostril show and significant asymmetry. 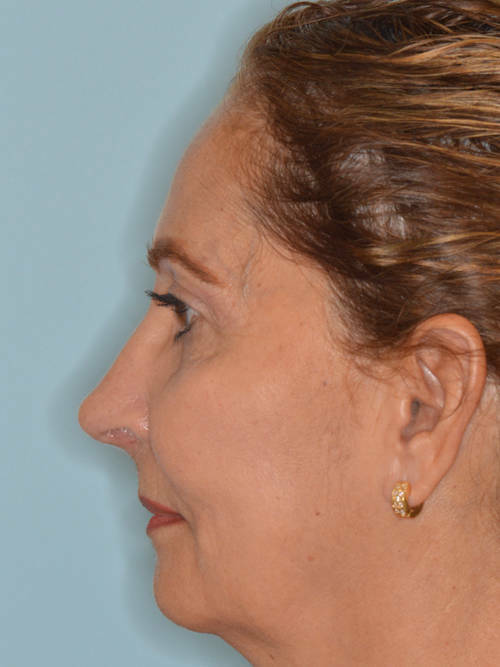 Her profile view showed the significantly upturned tip. 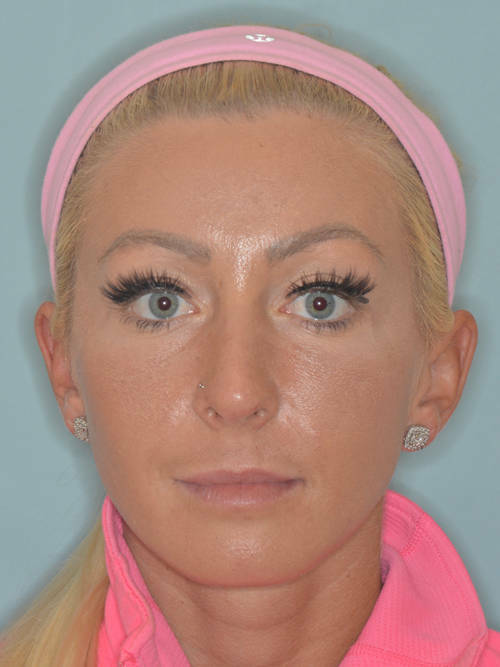 During surgery, her nasal tip cartilages were found to have been nearly completely removed and she was found to have significant scarring. 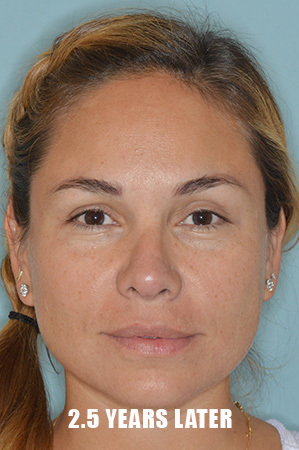 Her challenging procedure entailed the use of rib cartilage to reconstruct her tip cartilages. 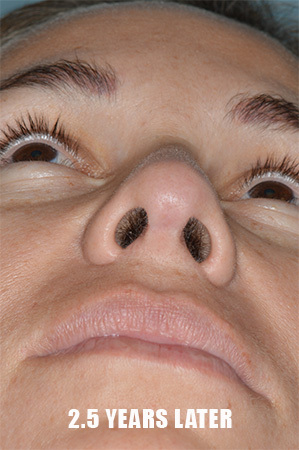 A septal extension graft was used to help counter-rotate her tip. 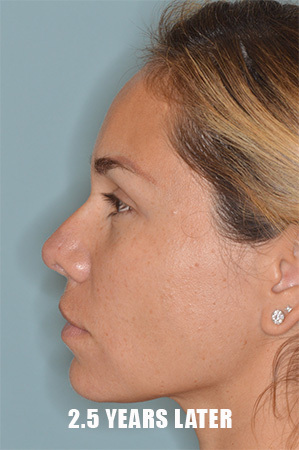 Lateral crural strut grafts were used to recreate her tip cartilages. 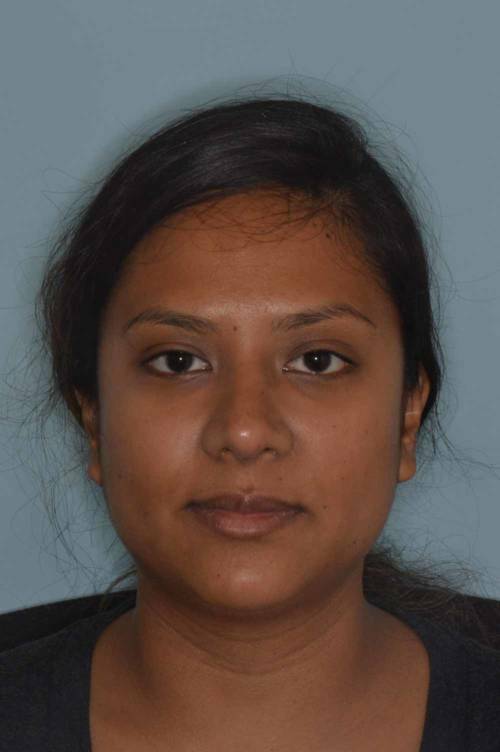 The patient is seen here 3 months post-op. 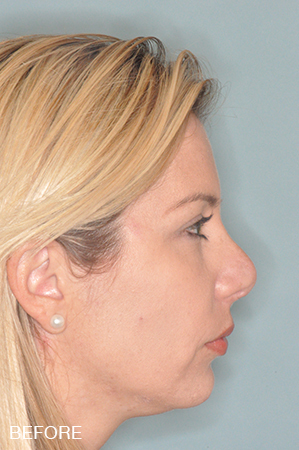 Very complicated revision rhinoplasty. 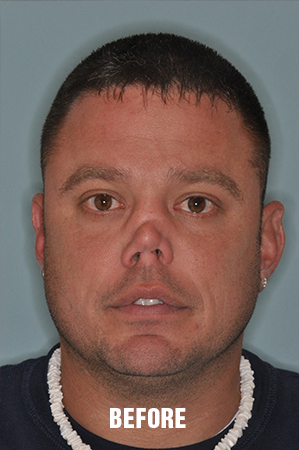 Patient presented for nasal deformity, aesthetic nasal concerns and nasal obstruction. 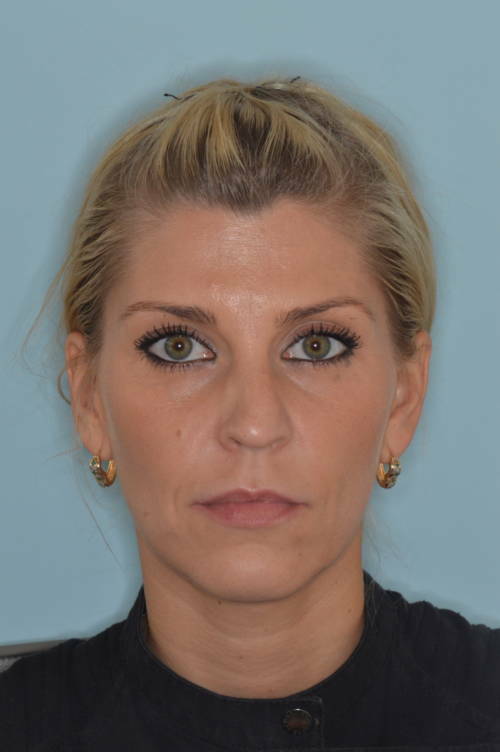 She had undergone a previous rhinoplasty 20 years ago. 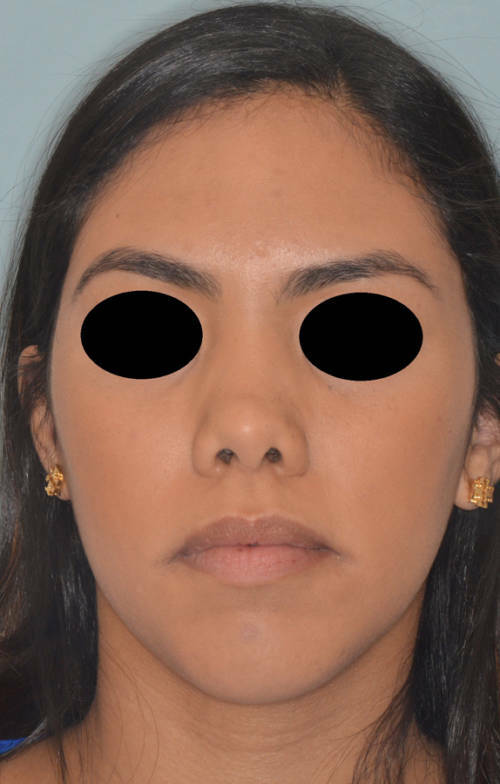 On examination she was noted to have a severe crooked nasal deformity and a total septal perforation. 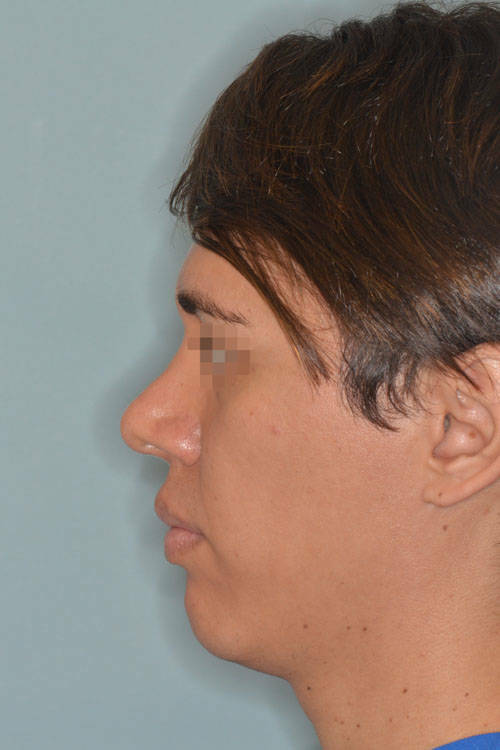 Several factors make this a particularly challenging case: previous rhinoplasty, severe crooked appearance, thin skin, and total septal perforation. 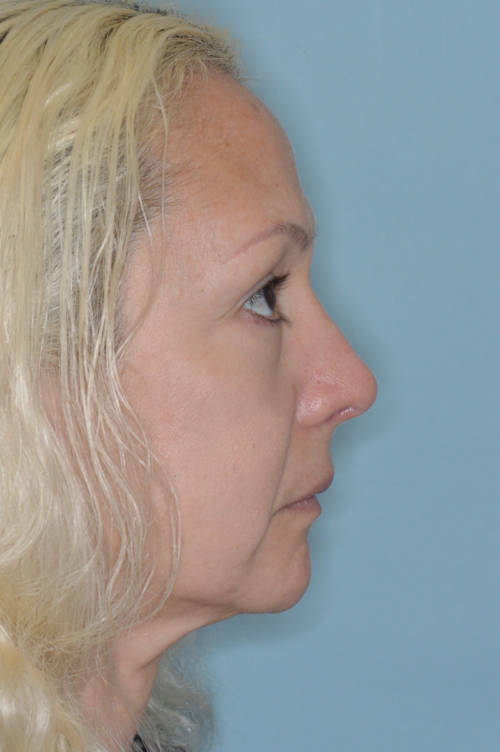 Given the complexity of her case and the absence of septal cartilage, a rib cartilage revision rhinoplasty was performed. 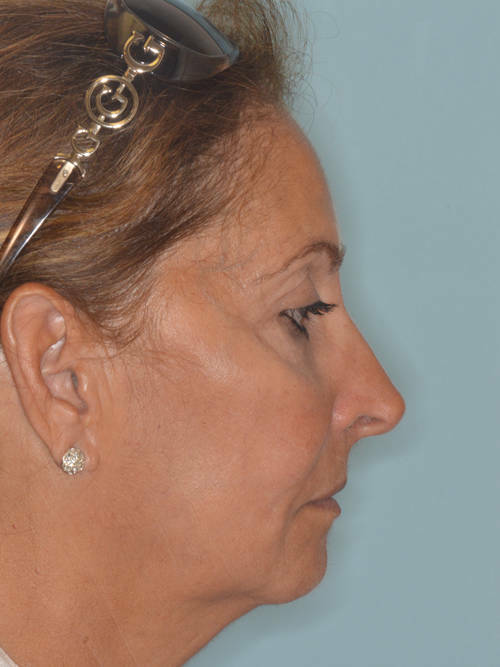 Her goals were for the straightening of her nose while maintaining a refined, narrow appearance. 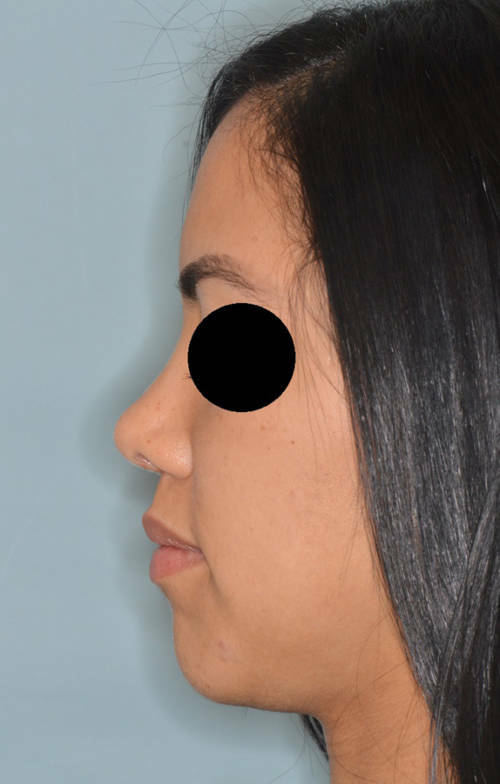 A revision rhinoplasty was performed using rib cartilage graft with the placement of spreader grafts, caudal septal extension graft, and lateral crural strut grafts. 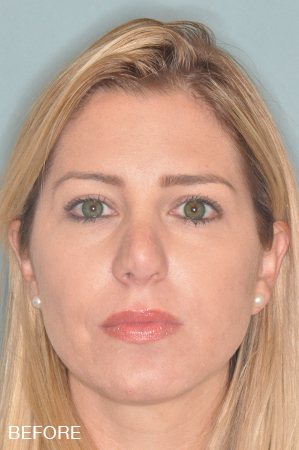 Seen here are post-operative results at one and three months. 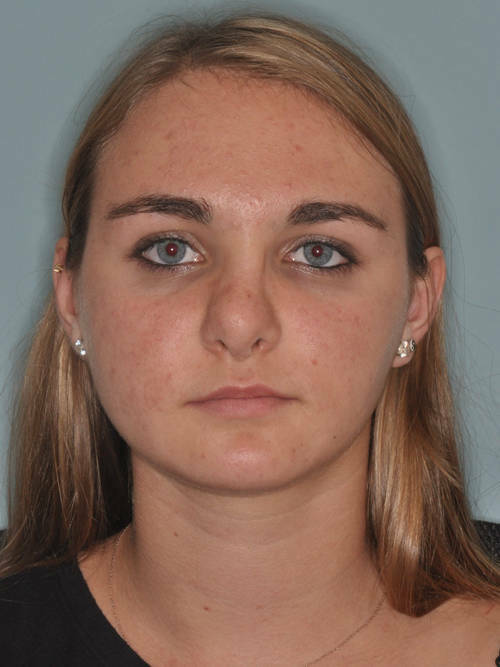 Note the significant changes in swelling in the elapsed time period. 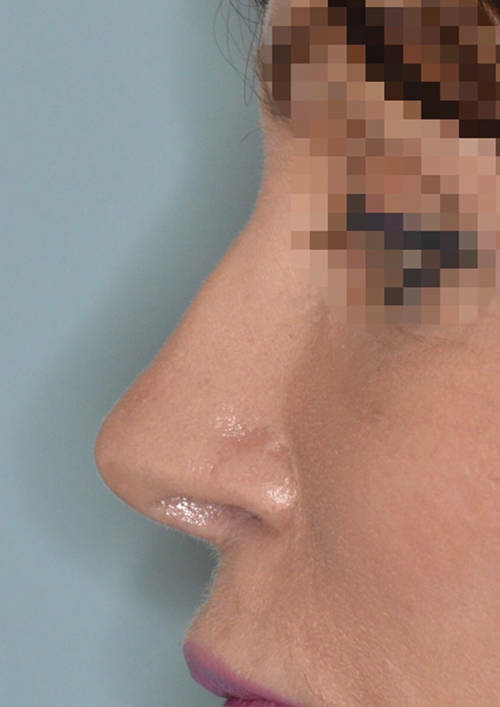 A very complicated revision rhinoplasty case. 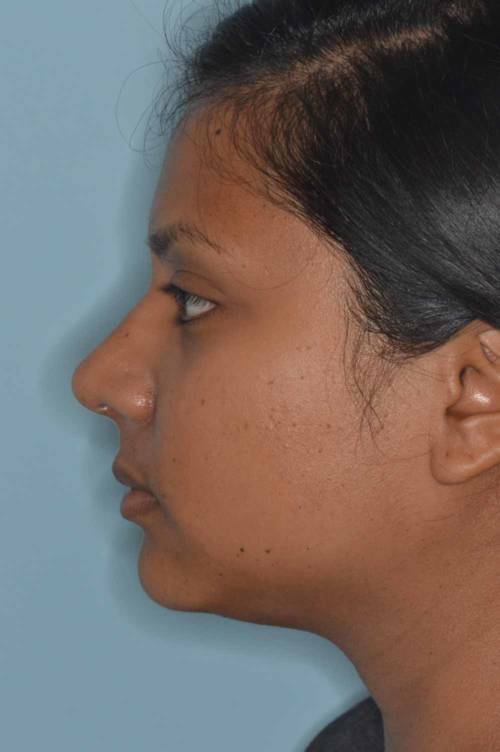 Patient has a history which includes nasal trauma and previous rhinoplasty. 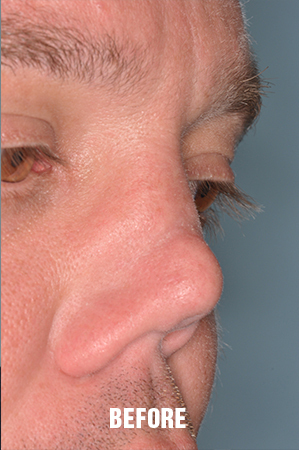 A synthetic implant used in the previous rhinoplasty which extruded through his nasal tip. 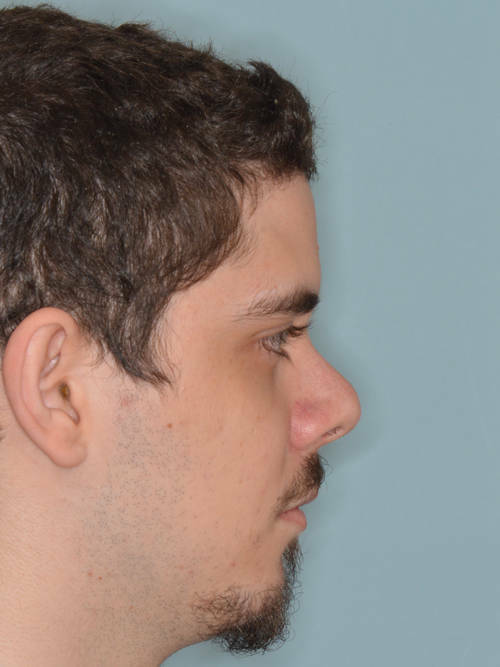 As can be seen in his pre-operative photos, he suffered from a severely retracted nose and loss of dorsal height. 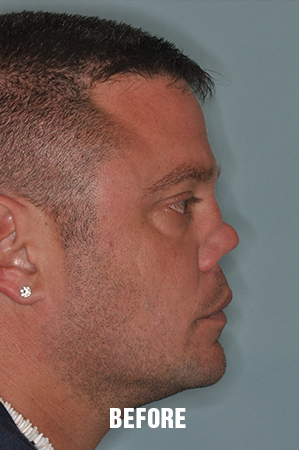 He was planned to be staged in two separate procedures to maximize cosmetic outcome. 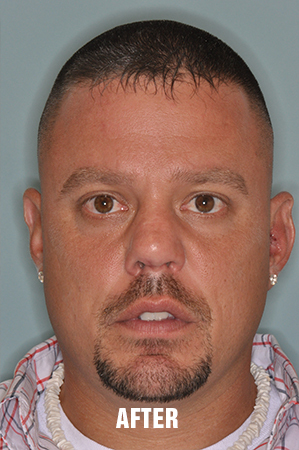 Here he is seen after his first stage procedure. 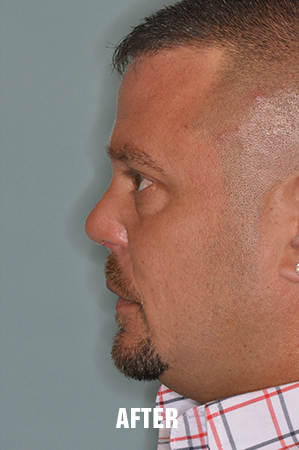 Rib cartilage was used to rebuild his nasal dorsum. 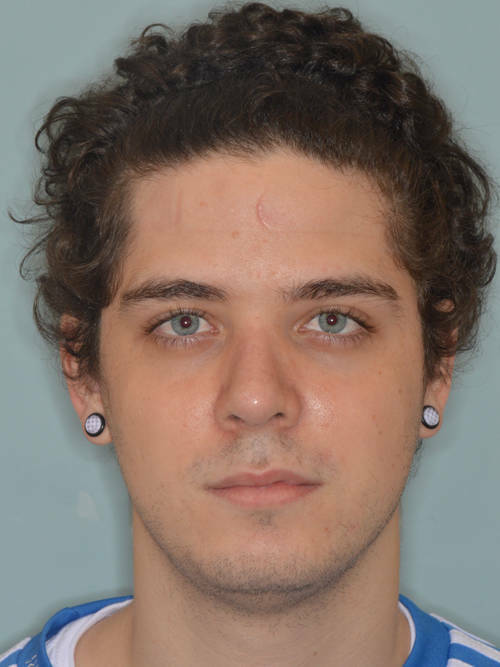 An entire reconstruction of his septum and nasal tip was accomplished. Rib cartilage grafts were used to rebuild his dorsal height, significantly counter-rotate his nasal tip, and increase his tip projection. 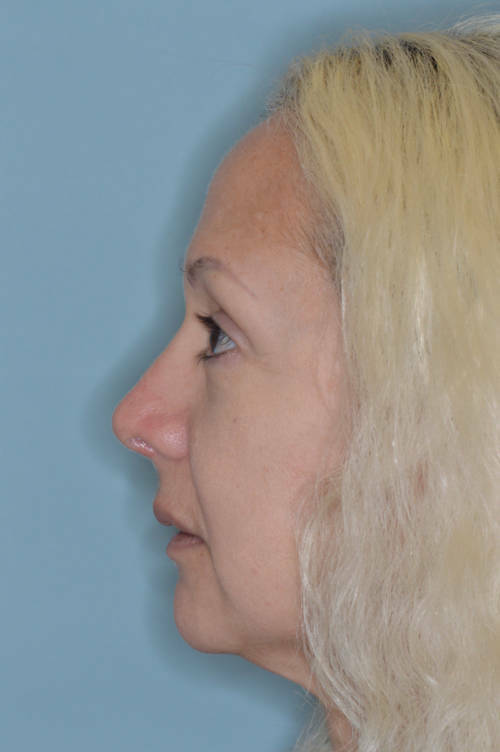 Frontal view: Patient underwent a previous rhinoplasty 5 years prior to revision. 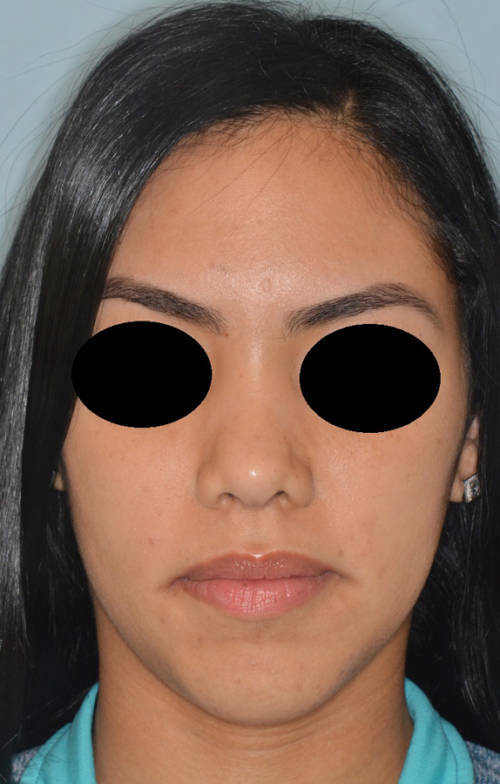 She was bothered by her bulbous tip and low dorsum (bridge). 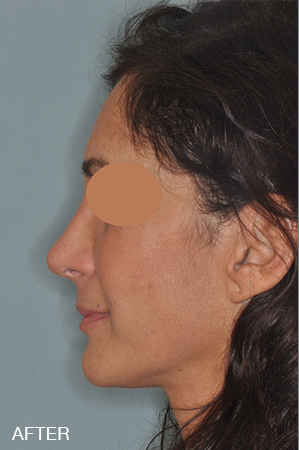 Profile view: On her profile view she was dissatisfied by the shape of her nasal tip and “scooped” nasal bridge. 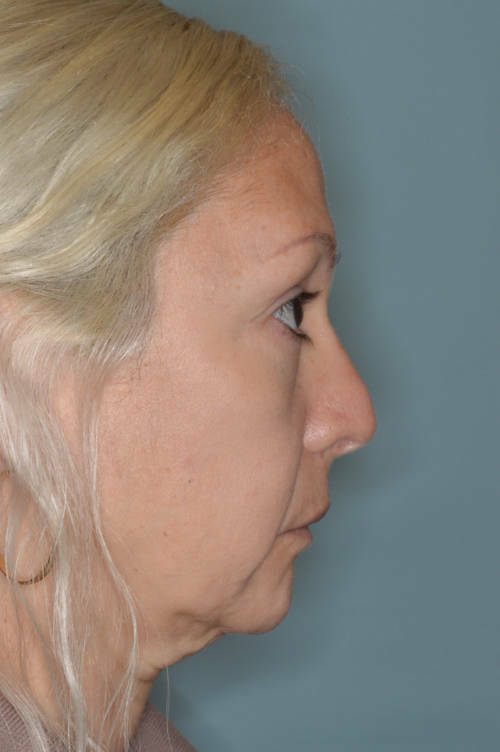 Her bridge was elevated with rib cartilage and her tip was refined. 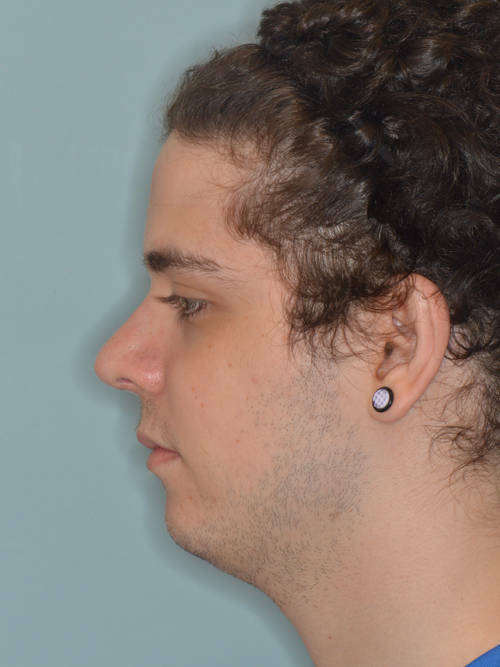 2.5 Years After: 2.5 year follow up on a revision rhinoplasty surgery for the correction of a sloped dorsum and severely upturned nasal tip. 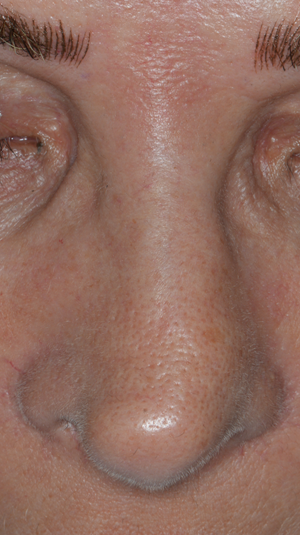 Follow up photos show the decrease in swelling and further tip definition on a patient with thick nasal tip skin. 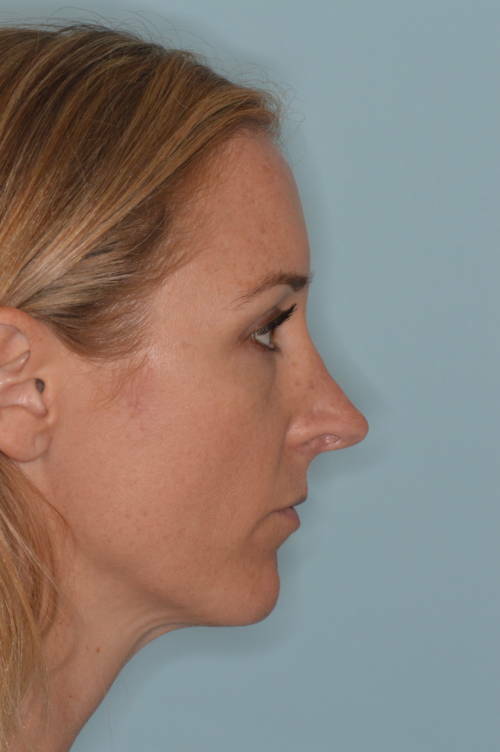 Also, seen is the stability and long term results of structural revision rhinoplasty.